Do you know where the bag is sewn from fish skin? Tradicional festival mood at the Festival of Folk Arts! 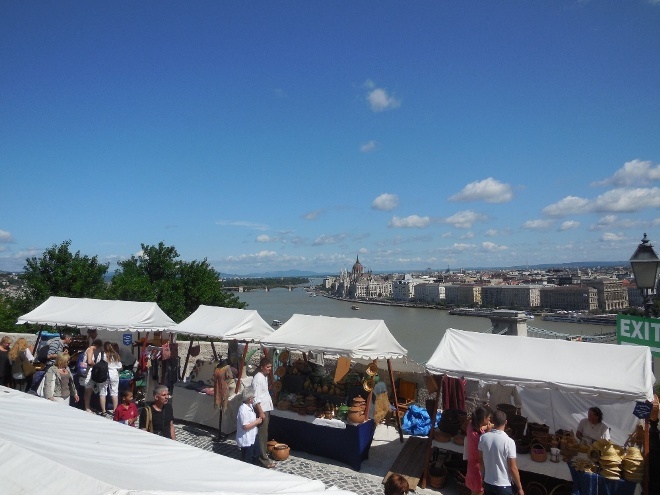 From 17th to 20th August, the country’s largest international handicraft festival will be held in the Buda Castle. The main theme of the event is embroidery, the guest of honor is Mongolia, but handicraft masters come from many other countries. The 500th anniversary of the Reformation will be celebrated with a large national exhibition and will also be an international blacksmith congress. Between the 17th and the 20th of August this year, the Buda Castle will be the meeting place for the most distinguished representatives of traditional craftsmen. The well-known Festival of Folk Arts is the most anticipated festival for the families where children and adults can get to know the culture of folk objects, try folk crafts, admire the artwork of craftsmen, meet with mammoth-bone carvings, fish skin sewers, bow makers, or other special representative of craftsmanship. The Festival of Folk Arts is a uniquely diverse international festival, which has been received the Certified European Festival title this year by the European Festival Association and has been included in the best festival of the continent. The Festival of Folk Arts is the holder of the EFFE (Europe for Festivals – Festivals for Europe) qualification which is awarded to the best European festivals, furthermore the Hungarian Festival Registration and Certification Program rated the event with the ,,Highly Qualified Folklore Festival” title. The protagonists of the event are the Hungarian craftsmen, who are the eloquent of the practical and spiritual knowledge and values. In addition to the more than 800 Hungarian and cross-country masters, the festival has hosted foreign craftsmen for years, seven guest countries are represented this year. In addition to the guest of honor, Mongolia, there will be Sakta-Sahara, Sahalin, Uzbek, Chinese, Tajik, Kyrgyz, Turkmen, Kazakhstan and Algerian masters. You can find out, among other things, who the Sahas, get acquainted with one of the most famous jakut mammoth bone carver and his craft, You can meet with Uzbek carpet weaver, Mongolian bowman, Turkmen silk painter, and get an insight how nyivh, ores and ainu masters from Sakhalin Islands make fish skin bag, briefcase, eyeglass case. At the Festival of Folk Arts, the artwork of the most distinguished folk traders can be seen in open and visual workshops, at the art exhibition you can try out and learn traditional folk craftsmenship. The theme of the event, which takes place from 17th to 20th August, is the embroidery, one of the richest and most varied branch of the Hungarian folk art. The embroidery workshops of the Festival of Folk Arts show the diversity that we find in the folk and gentle embroidery through the materials, motifs and stitching technique. They embroidered the solemn pieces, which is why they played a major role in the different pieces of folk costumes, pillowcases, cloths, blankets, tablecloths, but embroidered the accessories of church ceremonies. On the occasion of the 500th anniversary of the Reformation, the traditions of the Protestant churches are also given special attention during the programs and exhibitions. The Association of Folk Art and the Reformation Commemorative Committee in conjunction with the jubilee set up a tender for the renovation of the ceremonie accessories. From the best entries, a national exhibition will be held on the 17th of August, 2018 at the Festival of Folk Arts in the Gothic Hall of the Budapest Historical Museum. In connection with the intellectual and cultural heritage of the 500-year-old Reformation, a memorial column is carved and 25 headstones are being exhibited under an open-air exhibition with the title „Fa sírfejek, fejfák”. One of the special points of this year’s festival is the IV. International Blacksmith Meeting, which main theme is the unique, insoluble for hundreds of years welding process with which the joints of the Notre Dame gate were made. Professionals from ten countries – including Russia, Norway, Slovenia, Transylvania, Pakistan -arrive to the conference, the guest of honor is Magister Walfrid Huber, sculptor and blacksmith artist, retired professor at the University of Applied Arts Vienna, Honorary President of the Hungarian Blacksmith Guild. Programs, concerts, music, children playground are waiting for the visitors during the whole day. Besides Lajkó Félix, artist like Szent-Efrém Manchoir and Balázs Dongó Szokolói, Anna Csizmadia, Young Hearts Dance Ensemble, János Pályi, Tükrös Band, Buda Folk Band, Folk Embassy, Zsolt Zsikó and his orchestra, Bara Orchestra, Zoltán Kátay , the M.É.Z. and many others will perform. The stage programs and concerts are deeply pervaded by Zoltán Kodály’s memory. The festival which has became one of the most highlighted program of the summer and a not to be missed family program, has tens of thousands of visitors a year. Tickets can be pre-purchased at Ticketportal.